TBH i would not be taking that as, if it lets go, it could happen in a big way. - Tried gorilla tape - simple fresh water rinse, dry and apply multiple strips of 3" width length 6"
- Pulled boat onto dry dock (my TI trailer), did fresh water rinse followed by isopropyl alcohol wipe both inside and outside the hull. 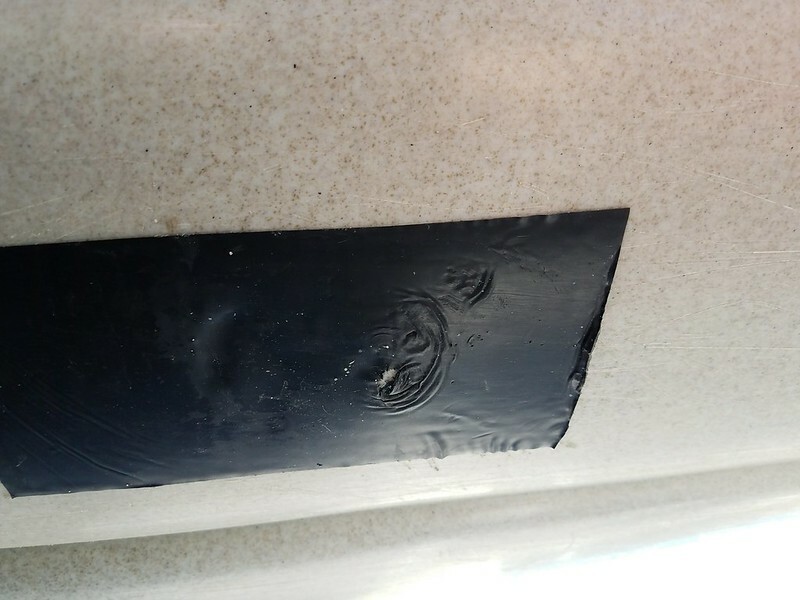 Applied strip of "Flex Tape" 4" width, 6" length. - Results - short term fix - test still in progress. Did brief 2 hour sail with no major water in the boat. The TI sat in the salt water for ~ 20 hours followed by a 6 hour sail in Gulf of Mexico with 12-15 mph wind and waves. Overall less water in the boat - a good thing. Brief inspection of the tape after pulling the TI out of the water and back onto my trailer showed the "Flex Tape" remained in place. The leading edge of the tape is beginning to pull away just a bit. Will return to the water in Port Canaveral over the weekend with planned sails in the Atlantic Ocean. 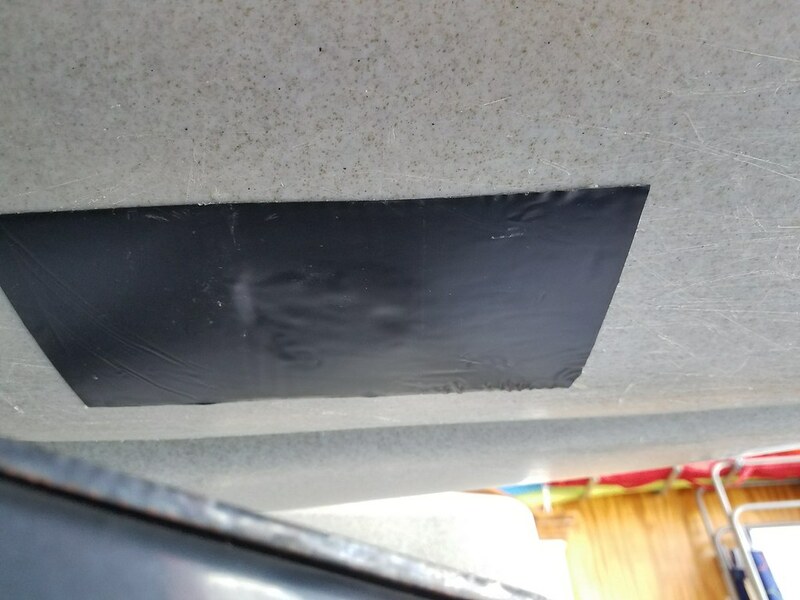 - Grade - B - I have added "Flex Tape" to my on-board emergency kit for off shore sails. Bottom line - got some additional sailing time with the emergency repair - a good thing. Kept within a mile of the shore. Will curtail deep offshore sails till hull is repaired or replaced. The hand bilge pump is now kept within easy reach on deck of the TI. See a few photos for the emergency hull repair below. Interesting, we found gorilla tape to be totally useless in water, however 3m duct tape works very well, (way more expensive, but much better, and doesn’t leave all that glue mess when you remove, like gorilla tape does). We found in all cases, (any adhesives), if you clean the polyethylene with bestest rubber glue remover/thinner, (available at home depot), let it soak a while, then dry and put a thin coat of krylon for plastics clear coat over the area you are working with, you will get much better results. Why do you ask,,, the rubber glue thinner is heptane, (heptane melts polyethylene). The active ingrediant in the krylon for plastics paint is heptane. I highly recommend before putting the flex tape on, you treat the area prior to putting the tape on. Roadrunner has also had very good luck flame treating the surface, (propane torch), if you want the best results, do both, (but be very careful since heptane is highly flamable). 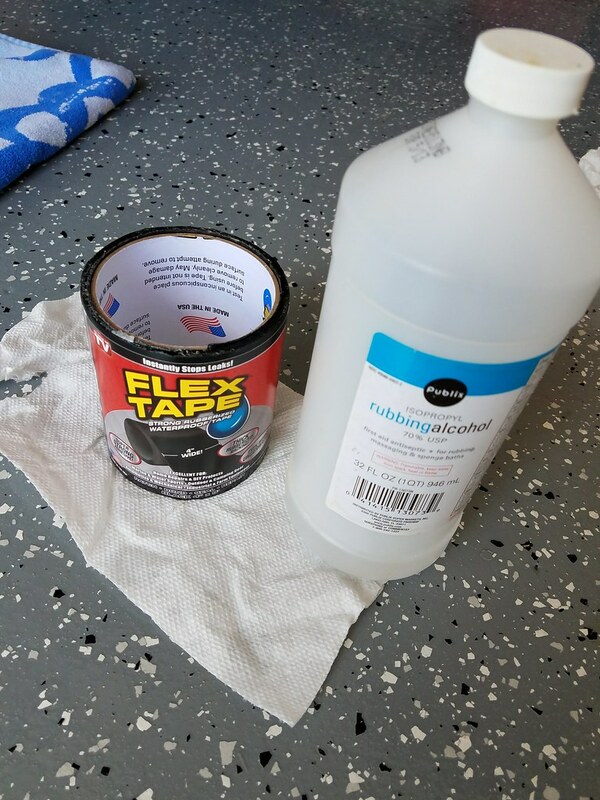 Once you put the flextape on, if you soak the edges of the flex tape with the krylon clear coat, (forming a fillet at the edge joint with paint), the water can’t get in and attack the edges of the tape. We find if you surface prep the polyethylene this way, you can easily use ge clear silicone to repair most anything. For example if you desire to re-enforce the mast base, its simple to cut an aluminum plate and drop it in so it is trapped between the back of the mast holder at the bottom of the hull, and the front of the mirage pocket inside the hull, ( doesn’t need to be a perfect fit). Then just glob silicone around the entire area, ( you want at least 3” of bonding area beyond any surface area you are trying to seal. Either silicone or west epoxy can be used, (we have used both on different boats). The reason the mast holder has to be re-enforced is the highest point of stress on the entire boat is the forward to back force on the base of the mast holder (side to side force is not an issue). This weakness is easily demonstrated if you so desire, simply open up your sail all the way then give the sail control line a swift tug, result will be either snapping the 1/4-20 stud, or ripping the hull, (just like in your picture), It’s random which will occur, (the force required to rip the hull is only slighly more than the force required to snap the stud, (now Hobie uses a stronger stud, the safety margin is much less that the original design). Before figuring out how to re-enforce our mast holders we snapped 6 of those little 1/4-20 studs when deploying our spinnakers back in 2010. It’s really simple math, all to do with leverage. The force on that stud is multiplied 17 times, simple math if you attach a rope to the top of the mast apply 200 lbs horizontal load to that rope, (simulating a fully loaded spinnaker). If you measure the front to back force at the base of the mast, the force at the base of the mast is somewhere between 2500- 3400 lbs of force. You can simulate this effect easily with a long pole, your car, and a brick in your driveway. Simply place a brick 1 foot from the end of an 18 ft pole, with the short end under your car. Now press down on the other end of the 18 ft pole with 2 fingers. You can easily pick up your car. When Hobie designed their spinnaker system I really wish they had consulted with a structural engineer. They should have incorporated a fixed rear stay, (their current design only relieves a fraction of the forward force). In other words with their current spinnaker design with the rear stay doing double duty as a combination halyard/stay is not strong enough, (do the math please). There is too great a risk of either snapping the mast, breaking the little 1/4-20 stud, or ripping the bottom of the hull when pushing the spinnaker too hard. Until Hobie fixes their designs I strongly suggest, ( in the strongest language), that you guys don’t deploy your spinnakers in strong winds, and whenever deploying your spinnaker never (I mean never) deploy your spinnaker without maintaining tension in the mainsail control line. What we do with our spinnakers on downwind is we keep our mainssil out all the way or partially furled but pulled very tight, (never allow the main to relax and billow while the spinnaker is deployed). Just tryin to help here that’s all. Sorry about over explaining till I’m blue in the face, but I feel understanding all the forces and stresses involved is pretty darn important. Edit: A very simple fix for the spinnaker users ( that will help some), would be too place the rear stay line inside a 3/8” dia PVC water pipe about ten ft long attached and suspended from the mast topper, (we just used spectra string). The tubing will help prevent the rear stay/halyard line from getting tangled in the battons on the mainsail. If desired, (and highly recommended), also add a fixed stay line, (can run within the same tube), that clips to the same cleat that your mainsail control lines an halyard pulley attaches to. Of course you will need to add an attachement point for the rear fixed stay line. Of course it is also possible to utilize the pvc tube itself as the fixed rear stay, but would require stronger attachment at the top and bottom of the pvc tube. In our case we abandoned the giant loop spinnaker halyard approach yrs ago, with a preference for a fixed stay line, and a separate spinnaker halyard mounted at the front of the mast topper mounted within a similar 3/8” dia pvc tube which runs down to harkin cleats mounted on the outer left cleat position on the front aka cross brace. If you wrap the halyard line around the aka cross brace prior to running thru thhe cleat, you can easily cleat in upward facing halyard lines, (simple fast and easy), we just stuff the excess halyard line into our mesh pockets by the front seat. Just tryin to help here. fusioneng, imteresting comments. Presumably, based on your calculations, Hobie can look forward to a flood of broken Island masts as their spinnaker kits become more popular. I have a question... if the mast topper remains fore and aft, how far away from the mast do you run the halyard pvc tube, to prevent it getting caught in the mainsail when it is furled? Is this partly the reason why you also need to extend the length of the mast topper? 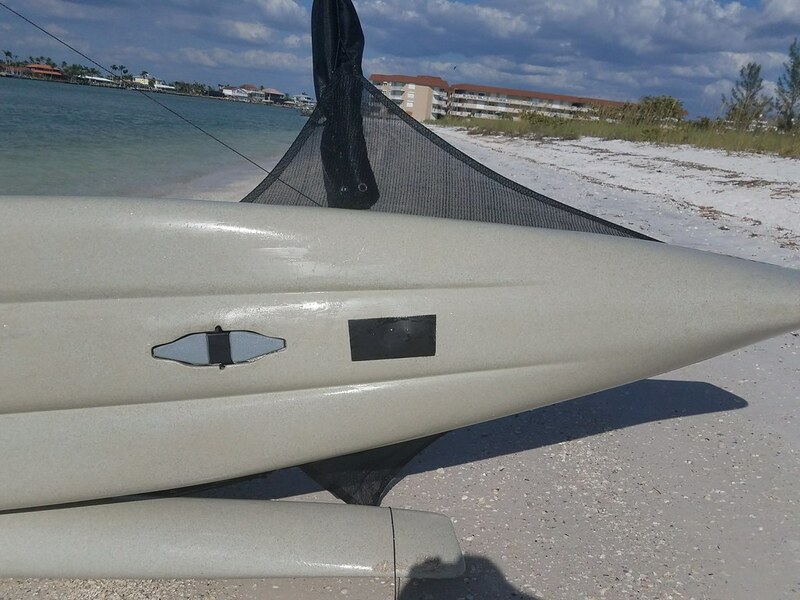 Hobies spinnaker kit is fairly priced, and in my opinion the spinnaker design is sound for the parameters they intended for recreational use on their boats in protected waters ( TI has an EC 'D' classification). Their code zero spinnaker is very small (about 80-90 sq ft). I believe they state in the instructions that the spinnaker should not be deployed in winds above 15 mph, (which sounds just about right, knowing the structural limitations of their designs). These are the European EC classifications:( keep in mind they are not binding in the US, but outline a very good 'rule of thumb' guide in my opinion). and significant wave heights of 4m and above but excluding abnormal conditions, and vessels largely self-sufficient. significant wave heights up to, and including, 4m may be experienced. may be experienced, with occasional waves of 0.5m maximum height, for example from passing vessels. buoyancy, and other relevant essential requirements listed, and to have good handling characteristics. I highly recommend people don't do what I did. It would be much easier to start with a stronger boat in the first place, however we wanted a complex boat that can be car topped, and can also be used for anything and everything we typically do, (including just kayaking). I'm a huge fan of Hobies design and concept, it fit the bill for us just fine and exceeded all of our expectations, (once we made all the necessary modifications). Keep in mind I abandoned that big spinnaker halyard loop running to the back of the boat a long time ago, (never could get it to work well), that rear line is a fixed stay line mounted inside a 3/8' dia PVC tube, (the tubing prevents the stay line from tangling, and prevents the line from snagging on the sail and battons). You might also note our mast topper is much taller than Hobies, and the rear is extended a couple feet so nothing ever touches the sail. I used the same point bearing design concept Hobie used at the base of the mast, (which works well, why re-invent the wheel, lol). I'm not suggesting anyone do any of this stuff, I'm only describing what worked well for us over a long period of time and much heavy duty usage. And trying to share areas of concern that need to be dealt with and be aware of if you plan to exceed Hobies original design parameters, thats all. Anyone know of any boats that are roughly the same size and as versatile as the Islands that do have a higher CE rating? I’ve been looking and haven’t found any. I liked the look of the Corsair Pulse 600 but was told by the AU distributor it has the same CE-D rating. 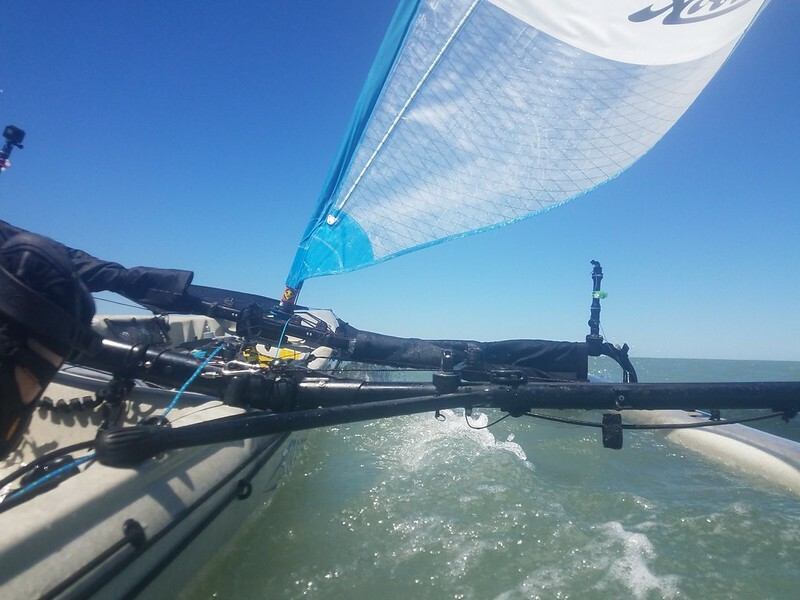 I completed about 5 hours sailing in the Hobie TI with the cracked hull in the Atlantic Ocean off Port Canaveral, Florida. The wind was blowing 12-15 knots out of the West and thus a mostly smooth Ocean on this day. 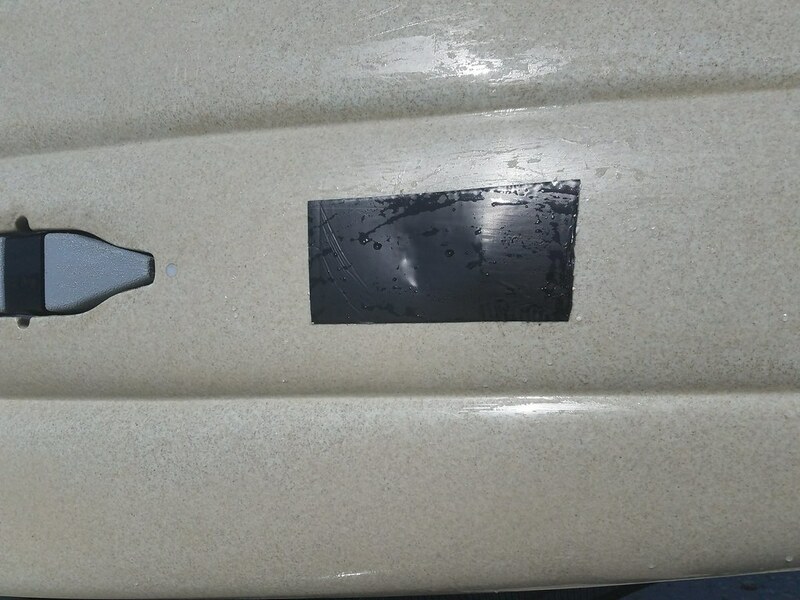 The emergency patch with the "Magic Tape" held up for the most part. The leading edge of the tape (closes to the bow) has begun to peel back a bit. 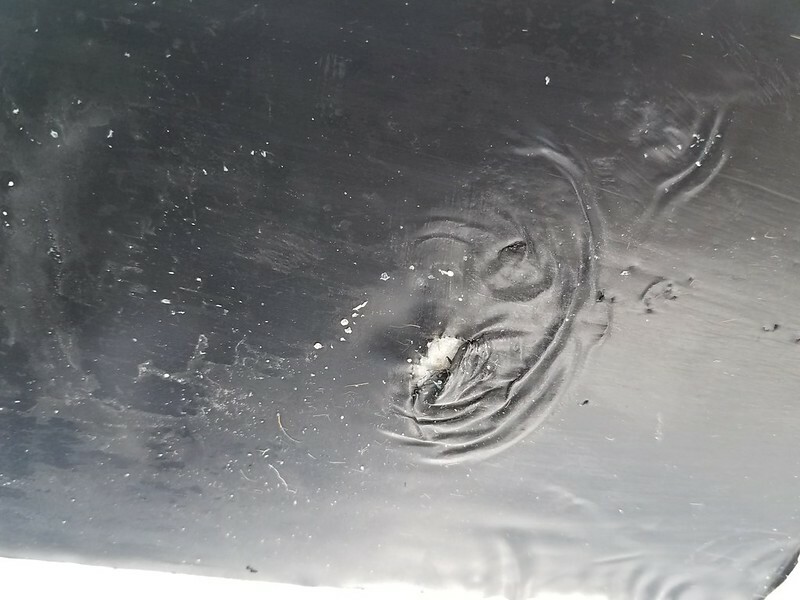 The tape did rip a few inches forward of the crack in the hull (most likely due pulling the TI up on the boat ramp at the end of the sail). Overall only a minor amount of water in the TI at the end of the sail (not bone dry, but not sinking either). I am still waiting for a response from my Hobie dealer on best course of action to repair / replace the hull. Still love the Hobie TI. Hoping to get back on the water soon. Fyi... we will not recommend a repair. The hull needs to be replaced. I will continue to work with my Hobie dealer on how to move the process forward. All of us were just trying to save your vacation, with ideas for temporary repairs to get you thru you vacation, we were all just tryin to help. Thanks for the tips and ideas. The temporary patch worked short term and I got two additional sails that would not have been possible otherwise. I always learn from unplanned events and build on them to create bigger safety margins going forward. I am back on the water. My Hobie was still under warranty and after a number of weeks my Hobie dealer replaced the center hull. No specific root cause was identified. I suspect an over stress forward or aft by the mast contributed to the crack. Bottom line. Hobie is a solid customer focused company and the TI is a wonderful craft. Hobie, Whatever it costs you to provide repairs for your customers as you've done here, it's worth it. To me, and I'm sure many others, Hobie is synonymous with quality and customer satisfaction even beyond the written warranty. I may sometimes be a bit critical here in this forum, but when people come up to me to inquire about my TI, which is virtually every time I launch it, I always tell them that Hobie is the foremost boat and boat manufacturer I've ever purchased from in over three decades of boating. For overall satisfaction, my TI is the best boat I've ever owned, and I've owned many. I don't consider myself a loyal customer to many companies, but Hobie is certainly one I'm very loyal to. They make incredible products and stand firmly behind them.